A few weeks ago I attended the opening days of the first Cleveland Triennial, a 3 month arts event that takes place all across the City. When I saw this fence, it sort of summed up my experience. The way the industrial material of these rebar orbs are treated in an aesthetic way, felt like something I would see at A2, and I wanted to share how I saw Cleveland’s industrial character intertwined with the creative. As a representative of A2 with VIP access to openings, parties, the press reception and curator led tours – and free non alcoholic drinks at the opening, I got to see how the arts are contributing to the revitalization of this one time booming City. 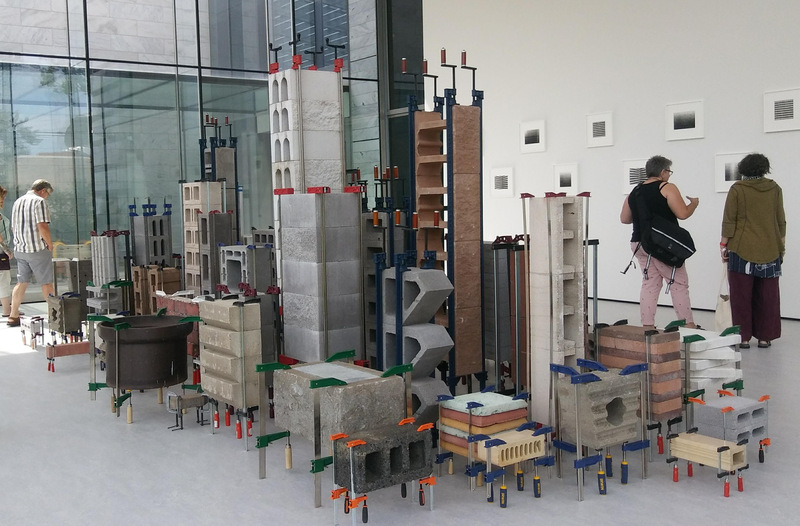 The event follows in the tradition of the Venice Biennale – the 123 year old tradition in which inclusion has been a significant accomplishment of the most successful and influential artists. Once the economic benefits for the city became apparent to the rest of the world, “biannuals” began to pop up all over. So much so that those in the “art world” report having “bianual burnout“! International gatherings such as World’s Fairs have lost their relevance, while those in the arts are thriving. 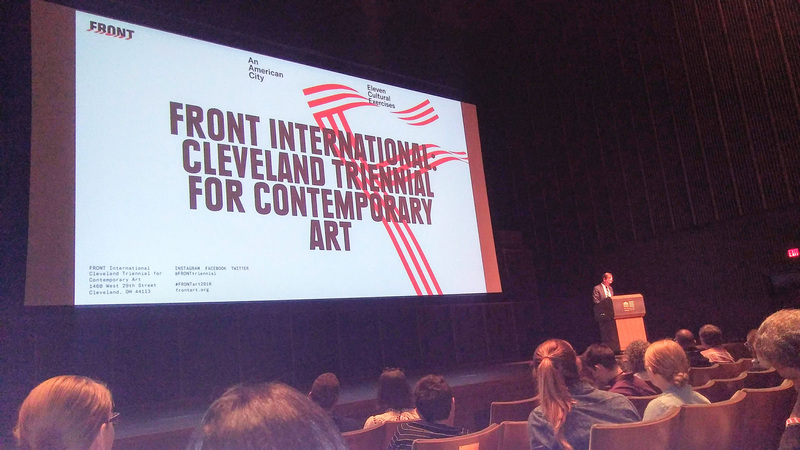 FRONT International: Cleveland Triennial for Contemporary Art is an exhibition consisting of artist commissions, performances, films, and public programs running from July 14 to Sept 30, 2018. An American City: Eleven Cultural Exercises, features collaborations with museums, civic institutions, and alternative spaces across Cleveland, Akron, and Oberlin. Visit the FRONT website for more information. I had never been to Ohio before and what I knew of its socio-economic history was not positive, so my first view of the city was a happy surprise! The vista across the Cuyahoga river with a multitude of bridges, smoke stacks of steel plants, ornate brick buildings and gigantic reflective skyscrapers was eye popping! Cleveland was a booming industrial and manufacturing epicenter for about a hundred years. It was a transportation hub where the iron ore was processed into the steel that built this great country, along with many other manufacturing industries. John D. Rockefeller founder of Standard Oil and US Steel started off in Cleveland. Cleveland’s biggest boom was during World Wars. It’s decline began in the 1960’s due to industrial restructuring among other things, by ’78 they entered into financial default on federal loans. During its heyday, prosperous patrons were intent on building a beautiful, culturally rich new city comparable with Paris or London. They were also concerned with the social welfare of the working population, the many immigrants and their families. The beautiful bones of the city can still be seen, amidst the decay, frenzied revitalization, sports stadiums, obnoxiously grand skyscrapers, and the Rock and Roll Hall of Fame. 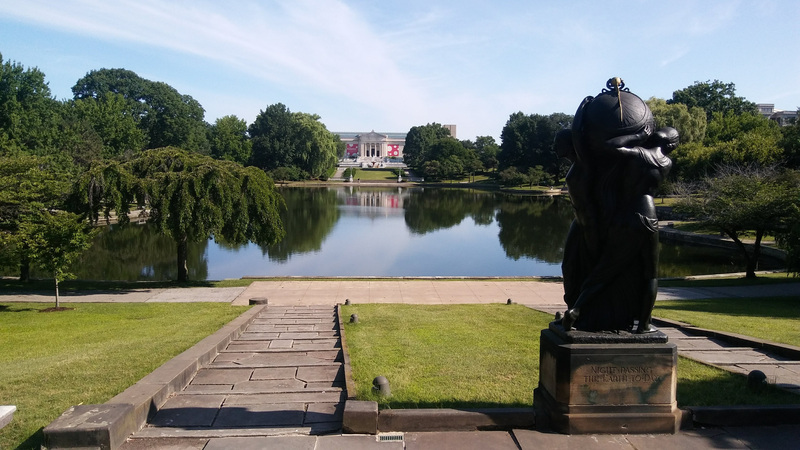 Cleveland Museum of Art, seen across one of the many parks in the city. On the East Side, we saw marvels of past including: Olmsted-like parks, the incredible public Library, The Federal Reserve and a shopping arcade with the largest glass & steel beamed roof. 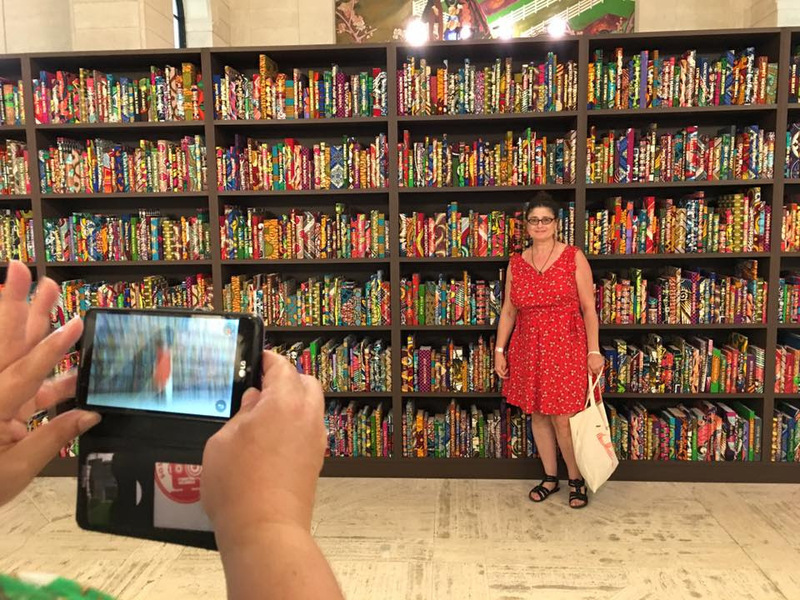 An art installation addressing immigration is in one of the many grand library rooms. The Library has a tiny/tidy makerspace with 2 laser cutters, a vinyl cutter, a 3D printer and computers with guitars for working in Rock Band. They have plans for taking over a whole floor since library use is really low. 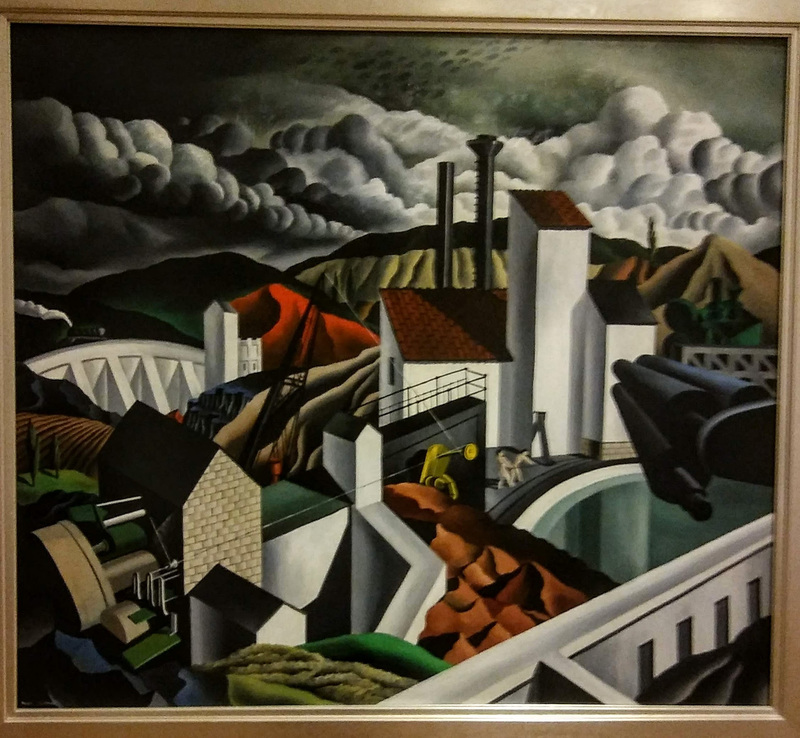 On the West side we saw beautiful murals in neighborhoods, Trinity, The Flats, Ohio City and beautiful Beaux Arts, Art Deco, Sullivanesque brick buildings. The old factories and warehouses, offer loads of great space for artists. We wandered around the 78th street studios,formally headquarters for American Greeting cards -now full of galleries and work spaces. I realized it was comparable in size to The Asylum, but times 4 floors! There is so much space out there! Again, artists have drawn attention to the value of formally unwanted real estate and they are being gobbled up by developers. Between the developers and artists little areas are being revitalized with murals, art spaces, bars, restaurants, shops and the old time establishments are benefiting. 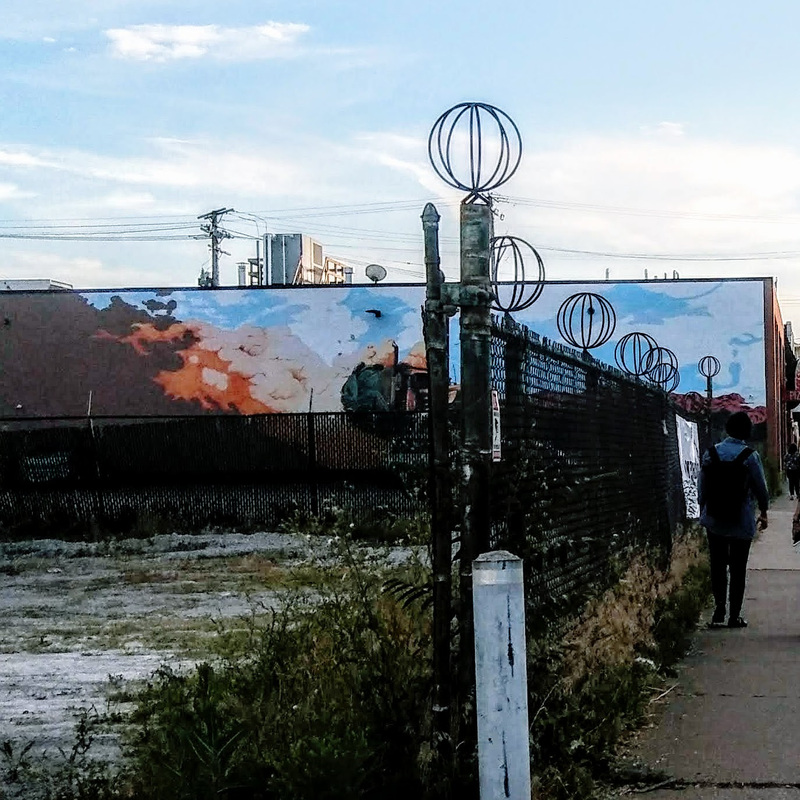 In an area called Hinge town, the conversion of the The Transformer Building at 1460 West 29th Street has stimulated a lot of activity including a project at SPACES that brings the community together to try to make something positive grow from the shooting of 12 year old Tamir Rice. An installation by Dawoud Bey at St. John’s Church commemorates the Underground Railroad. There is a Cafe and Deli in a beautiful renovated firehouse. Hingetown: roof deck of the Triennual’s patron who renovated The Transformer Building into an arts space and lives above SPACES, a gallery that features community arts projects.It was interesting to see the beautiful old iron work in conjunction with the video installation about the economy Philip Vanderhyden. 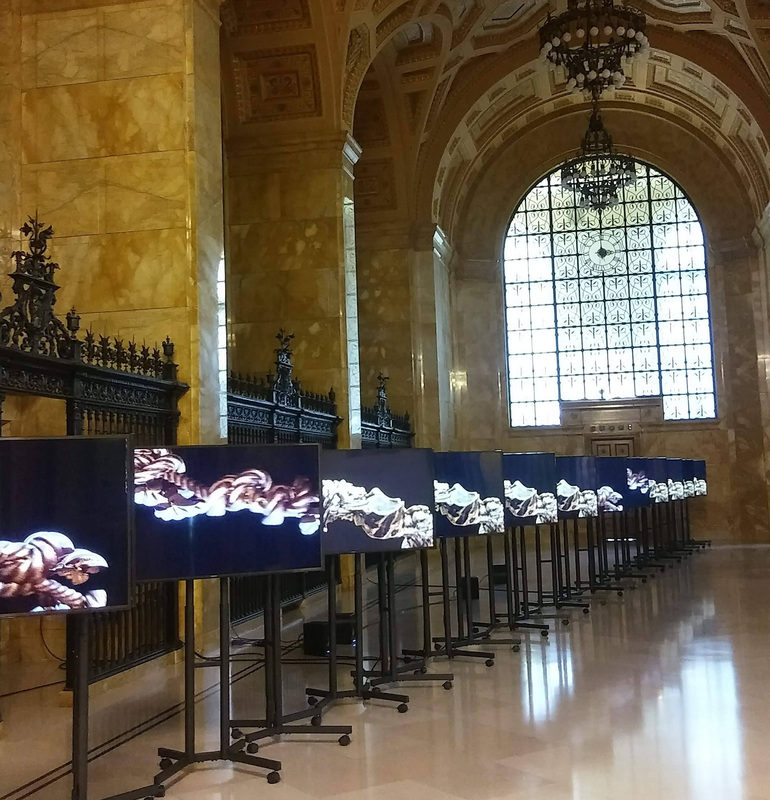 Video installation in the Federal Reserve Bank on Detroit Ave. The Cleveland Museum of Art has an incredible collection! It was awesome to see works by Picasso, Nevelson, Warhol I have never seen before in person. geometry and its futuristic, satellite-like look. I have a predilection for abstract sculpture and my work is made with materials I find at A2. After reading the wall text, I felt it sounded a lot like A2. In an era when most sculpture was made by traditional methods such as carving or casting, he instead employed industrial techniques to create his inventive works. His studio was more akin to a machine shop, complete with drill presses, lathes and dies. We were pleasantly surprised to find we could get tickets to the sold out Yayoi Kusama show. She was involved with the “god father of assemblage” Joseph Cornell in the 1960’s. I had no idea that her work consisted of infinity mirrors (something I have been planning on doing.) I also recently found out, one of her boxes, which you walk into, is currently at DeCordova Museum in Lincoln. So you can experience it yourself! Melissa’s work reflects the rapid pace which technology becomes obsolete and the resulting glut of old computers. She is concerned that many people don’t know what to do with their old technology and feels manufacturers must begin to take responsibility for the disposal of their products. Growing up, her father worked at Raytheon (1960 –90) and brought home outdated equipment that was being thrown out. Nevertheless she never opened a computer until joining The Artisan’s Asylum, maker space in Somerville, MA where she has had a studio since 2012. She is the recipient of surplus parts, cruft, e-waste from the other members. The older the computer/tech the bigger and better the parts are. There is a limited supply of the most beautiful parts. She is documenting a period of technological development that quickly becomes history. She finds beauty in the abstract shapes and colors of the wide variety of components. Her work has been described as, “Structural Poetry”.